LTHForum.com - It's holiday time. What's in your flask? LTH Home > Chat > Something to Drink > It's holiday time. What's in your flask? Whiskey, brandy, schnapps, mezcal? Whatcha' packing? Packing in some Old Rip Van Winkle 10 for my wife's office party. We got a $75 credit on Lyft so if I'm going to drink it might as weller be good stuff! Picked up a couple bottles of A Midwinter's Night Dram (two different "Acts" as they label them) from Moreno's during their whiskey spectacular last weekend. Really delicious stuff and very sweet (for rye) that makes it easy to sip neat at body temperature from a flask! 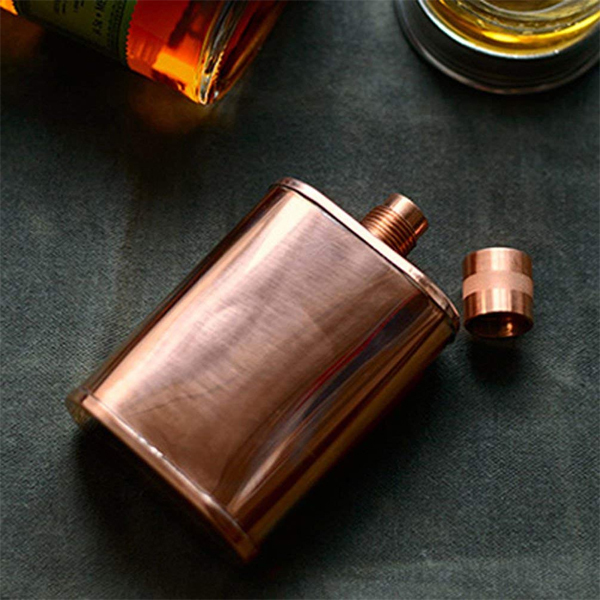 Was recently gifted a beautiful handmade in Vermont copper flask, The Vermonter from Jacob Bromwell. Even received the matching copper funnel! My other flasks will now be relegated to back up use. This was one of those special gifts of things you will treasure but, but wouldn't pull the trigger on for yourself. Just broke it in last night with Weller 12 from an old stash for improv night at the Comedy Clubhouse on Ashland. Al Ehrhardt wrote: Was recently gifted a beautiful handmade in Vermont copper flask, The Vermonter from Jacob Bromwell. Beautiful! As you say nothing I'd buy for myself but a wonderful considerate gift that will last generations. I've received flasks as gifts in the past one of the more considerate was from Michael Killmer, then representing Templeton Rye. It was filled with Templeton Rye, never before or since have I received a filled flask. A surprisingly considerate touch. Thanks again Killmer. Absolutely. Here's a pic of what it looks like . . . I've got many flasks, both grand and chintzy, but my #1 is a Vargo Titanium Funnel Flask (hey, it matches my hips!) that's currently filled with some 2015 Felipe Cortes Tepextate that I muled back from Oaxaca last Spring. ronnie_suburban wrote: my #1 is a Vargo Titanium Funnel Flask. I have ogled that flask... Very nice. Love titanium, besides a titanium hip, also have a titanium Panerai watch that I like a lot. Titanium is very stealthy. Hehe, indeed. I like that the Vargo is seamless, lightweight and just about indestructible. It's seems completely leak-proof. The built-in funnel is super convenient, too. What I don't love about it is that the cap is very small and fully removable, so I think losing it or dropping it where it cannot be recovered are both quite possible . . . especially because the more you "use" it, the more likely you are to become clumsy. Back to the Comedy Clubhouse for improv night. In the Bromwell was an older bottle of Evan Williams Single Barrel that was barreled in 2004 and dumped in 2014. Was never a huge fan, but they were nice values for 10 year old bourbon. I think they are now 6 or 7 years and more expensive, I stopped buying. In a stainless flask with a Horween leather wrap was Pierre Ferrand Dry Curaçao for Nancy, which she enjoys as a 'dessert', after dinner. While not in the flask, we really liked a 2014 Rivers Marie Summa Vineyard Pinot Noir with dinner. RM is one of the only cooler climate CA pinot's that I buy. I avoid some vineyards are are too big for my taste, but they are always crowd favorites and I still like some of them. Tullamore DEW. And god bless it, every one. Sotol. Thanks for the introduction, Hammond. Friday night was Russell's Reserve 'Red Label' Single Barrel Bourbon. Heard about a new improv group a few months ago and finally made it to a show. We really enjoyed all four teams at Logan Square Improv. Highly recommend it! BYO and very inexpensive. They told me they will be moving to another location near Diversey and California sometime soon.